There be treasure in these waters, and you’re out to find it. The map is a little abstract, and you kind of have to build it as you go, but you’ll find the treasure, all right, even if you have to cut your crewmate off to do it. Enter the world of Gold Ahoy!, where the treasure is plentiful but the paths to get to it are not. Gold Ahoy! is a tile-laying game for two players. 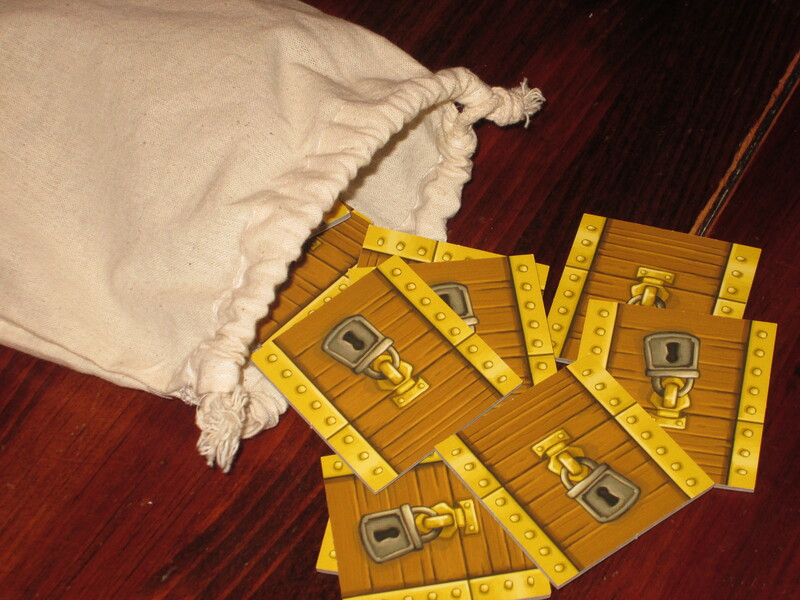 Players place tiles in a 6×6 grid to gain access to treasure chests. The player with the most treasure chests at the end of the game is the winner. 1. The tile must connect to at least one edge of a tile already placed. 2. The boundaries of the board cannot extend beyond a 6×6 grid. 3. Players may not place tiles to start a row on their opponent’s side of the board. No, seriously. These are, essentially, the three rules of the game. Players take turn placing tiles until all the tiles are placed in a 6×6 grid. 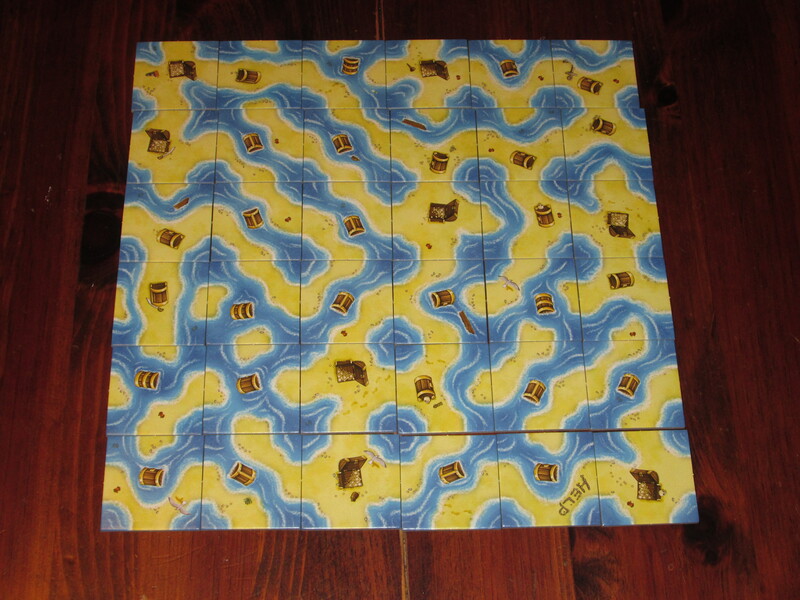 Players then follow the water and land paths on their edge of the board to treasure chests. If both players have access to the same treasure chests, the player with more paths to those treasure chests scores the points for them. Whoever has the most points is the winner. Gold Ahoy, or Chips Ahoy? Great two-player games are a staple in any collection. 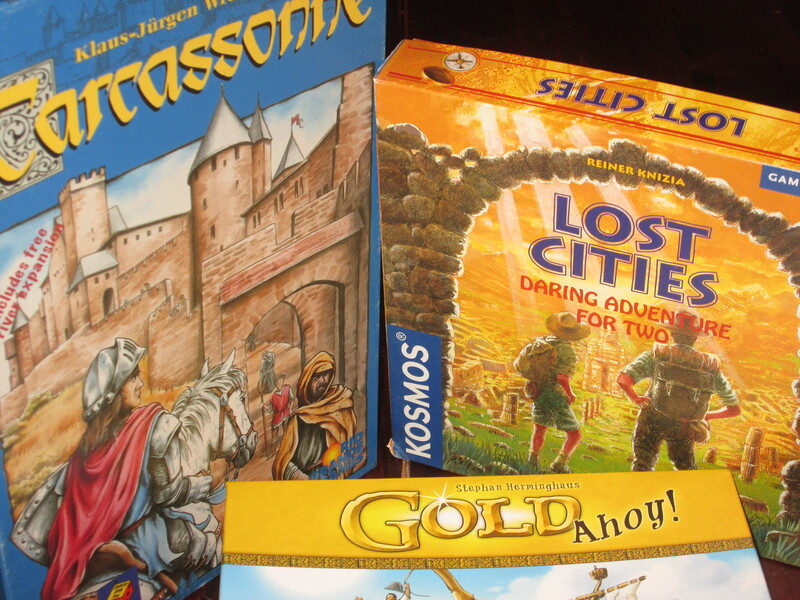 The games that my wife most wants to play are the ones that often receive the most table time, even over games that I might prefer, which I relegate to game nights or lunch hours. But the field for great two-player games with staying power is also crowded. So how does Gold Ahoy! stack up? Unfortunately, not very well–at least in my context. But let me explain. Gold Ahoy! comes with a (slightly small) drawstring bag that is good for transporting the game. It has almost no setup time, and cleanup is a cinch. Gold Ahoy! has some really neat things going for it. What I love about the game is the changing shape of the board. The board has to develop into a 6×6 grid, but because you are not building the board yourself, it can often get away from your vision for it. In my vision, the first tile I place should be in the right corner closest to me. But because of the dynamic game state, that tile might end up in the middle, or even on my opponent’s side of the table. This is something I really enjoy. Even more than Carcassonne, which involves free-form tile placement, players are vying for positioning on a board that can change shape a lot until the rows and columns are locked in at six each. I really like this concept. It’s an interesting rule that players may not start rows on their opponent’s side of the table. This adds to the tension, as you cannot intentionally start a bogus home row for your opponent. However, as in Dracula, if the opponent begins the row, thus welcoming you to place tiles there, fear for your throat. A completed board in Gold Ahoy! Actually, this one is a reconstructed completed board, as my sister messed the tiles up after I won by a handy margin and vowed never to play again. I also get some satisfaction from just the act of building. The look of Gold Ahoy! as you construct the board is appealing, and it’s fun to see all the island and waterway shapes form as you place tiles. 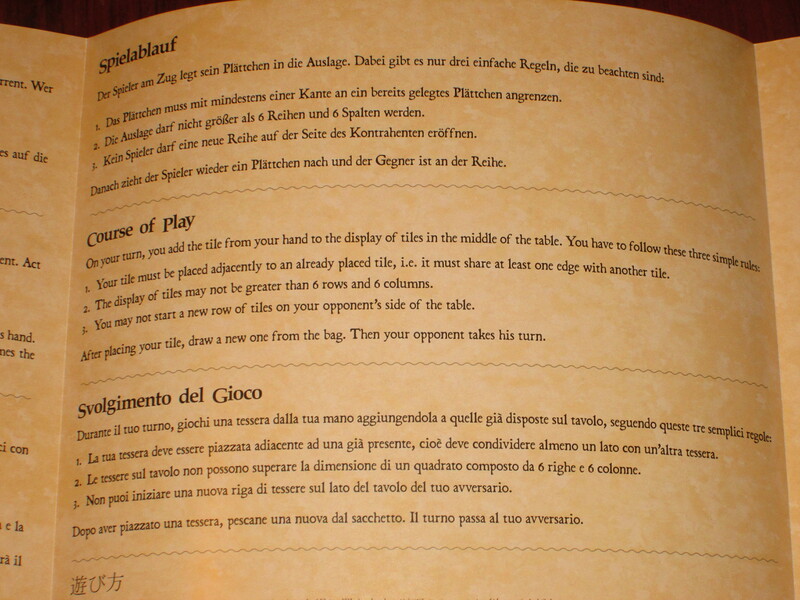 The tiles in the game are thick and sturdy; the artwork by Klemens Franz, while sparse, is great (especially the island piece with “Help” scrawled in the sand); the rulebook is clear; and the included draw bag is handy for carrying the game around. I just don’t find much use for Gold Ahoy! Before I go further, let me reveal a huge bias against it: my wife hates this game, and she hates it because it involves a healthy dose of spatial reasoning and especially mental rotation, which is something that frustrates her. After our first game, I asked if she wanted to give it another go, and this is one of the few 10-15 minute games that she outright refused to play again. I thought this was odd–I enjoyed it well enough. So I decided to try another audience and played several games. Alas, the reception has been equally cool. Gold Ahoy! is an odd game in that while it’s perfectly fine–the game works, it looks good, it’s even somewhat fun (although from my plays and from looking at other people’s opinions, I may be alone in this assessment)–it is also perfectly forgettable. Or, at least, if it’s not inherently forgettable, it’s at least forgettable in the context of the games it would most likely be compared to. Part of this is the samey nature of the tiles. While it makes the game board appealing to see the shapes of land and waterways, the tiles merge together, and they all feel more or less the same. The tiles lack special character, and it’s hard to identify the tile you hope you draw from the bag, which is half the fun of a tile-laying game. There’s no moment, as in Carcassonne, of hoping you draw the tile shaped like a dinosaur tail, or the cloister that dead ends a road, or the tile that, rather than merges the two cities together, separates them unequivocally. While the 6×6 grid and the players not knowing the exact coordinates where their tiles will end up is interesting, It’s not as interesting as other games in the tile-laying genre, even the been-there-done-that, elephant-in-the-room title Carcassonne. Gold Ahoy! is a short game in a small box, but it doesn’t have as many uses as other games like this. It’s two-player-only, which already limits its utility. It’s also a simple enough game that it’s a hard sell for more strategy-minded gamers. I don’t agree with the assessment that there’s no strategy in Gold Ahoy!, but it’s hard to see when you hear the rules and start playing. Sure, you can get at the strategy by playing multiple games, and I’m sure some players will like that aspect of it: a game that gets deeper as you play. But since two-player-only experiences are rare with my hobbyist friends, it won’t see enough plays to reach that point, and it’s not a good “sip test” game. It could work as a couples game–especially a travel game, since with the included bag it’s very portable–but the couples space is a crowded market, and there are established favorites that are hard to topple. It’s hard to beat the accessibility/tension and decisions per minute ratio of a game like Lost Cities or Jaipur. Perhaps for more spatially minded people, this will be a hit. Alas! It wasn’t in my household. Obviously, tastes vary, and you may feel quite differently. I don’t have lots of physical space in my collection, so I usually choose games based on how well they fit a niche, and Gold Ahoy! doesn’t fit into any useful niche for me. It’s too simple for my hobbyist friends, it’s not as tense as other similar games that take around the same amount of time with my wife, and it’s not as interesting as other tile-laying games despite the clever idea at the center of the game. While I like the concept and love the artwork from Klemens Franz, if you’re on a treasure hunt, I recommend you keep digging. 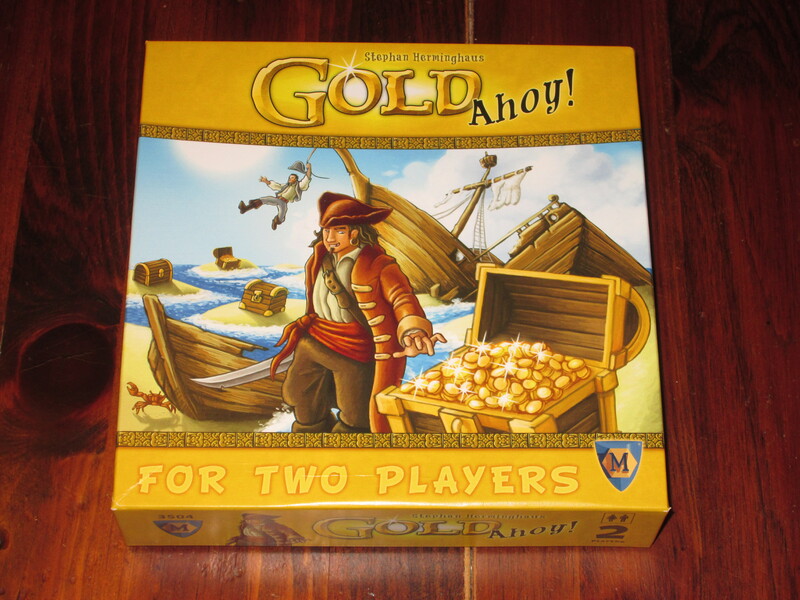 iSlaytheDragon would like to thank Mayfair Games for providing us with a copy of Gold Ahoy! for review.